In my Research Skills course at the University of Cambridge, I use the Gettysburg address as an example presentation. The course is about how to give good research presentations, so it may seem curious that I use a political speech from the 19th century as an example. However, I find that this speech has much to teach us. My original reason for choosing the Gettysburg address was that Peter Norvig has produced a Powerpoint presentation of it. His set of slides demonstrates how a presentation tool can turn a good speech into a poor presentation; this was the key teaching point in the first year I used it. The Gettysburg address is sufficiently short (two minutes) that it is easy to give twice in a lecture: once without visual aids and once with the Powerpoint slides. A video of the first time I lectured this (2009) is available online. My subsequent investigation into the history of Abraham Lincoln’s address provided a range of other lessons for students preparing for a life of giving technical presentations. The Gettysburg address was commissioned as a short speech dedicating a military cemetery in Gettysburg, Pennsylvania. It was almost the final act in a three hour-long ceremony of dedication, which included music, prayers, and a two-hour long speech by Edward Everett, one of the great orators of the day. President Lincoln was invited to give the dedication a mere two or three weeks beforehand and his brief was simply to dedicate the cemetery “by a few appropriate remarks”. He did rather more than this. What follows are the lessons that I use in my Research Skills class. It is quite possible to give a riveting talk without any visual aids. Norvig’s slides clearly detract from the message. If you do choose to use visual aids then ensure that they add to your talk rather than detract from it. Lincoln did not speak off the cuff. He planned the speech carefully. There are five or six drafts of the speech, most prepared in Washington before Lincoln travelled to Pennsylvania. He worked hard on this speech, ensuring that it said exactly what he wanted to say. You also need to plan when you are invited to speak. You cannot deliver a talk well without rehearsal. In order to get the phrasing and timing right for delivering the Gettysburg address, I have to rehearse it three or four times beforehand each time I give this lecture. Likewise, when I am preparing research talks, I will generally run through my talk a couple of times the evening beforehand, to ensure that I am clear in my own mind what I am going to say. 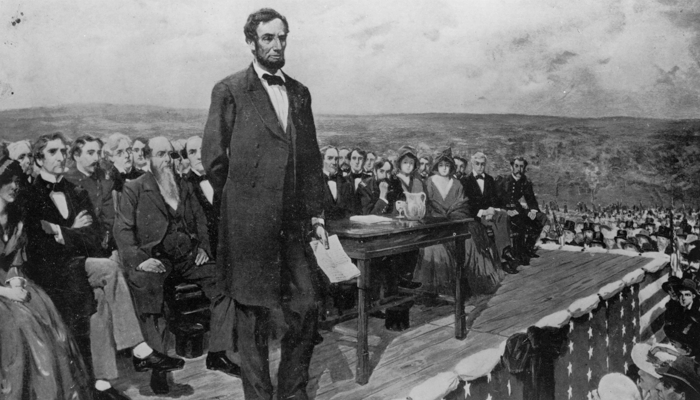 Lincoln was invited only to give a two-minute dedication speech. He could, conceivably, have refused. But he grabbed the opportunity to address a crowd of 15,000 people, which included six state governors and many others who had influence in American society. We researchers should, similarly, be ready to grab any opportunity to present our work to our colleagues. Lincoln was asked to give “a few appropriate remarks”. He knew that this meant he had only two or three minutes. He did not rail against this and write to the organisers asking that he be allowed to speak for longer. He worked within the constraints he was given to do the best he could. Likewise, if you are asked to prepare a fifteen minute presentation, do not prepare a thirty minute presentation and hope that the organisers will accommodate you. They won’t. Work within the constraints you are given to do the best you can within the time available. Lincoln certainly did not restrict himself to “a few appropriate remarks”. He made a political speech that inspired his audience. The construction of his speech is clever. The first five sentences are exactly the sorts of things you would expect a president to say when dedicating a military cemetery. His sixth sentence must have come as a shock to his audience. Lincoln says “But, in a larger sense, we can not dedicate, we can not consecrate, we can not hallow this ground.” One can imagine members of the audience thinking “What does he mean by that? What is he talking about? Why can we not dedicate this ground?” Lincoln then goes on, in only four sentences, to inspire his audience to re-dedicate themselves to the cause of freedom. He does what he is asked to do, to dedicate the cemetery, and then goes on to say so much more: to say what needs to be said. Lincoln did not restrict himself to dedicating the cemetery, he interpreted his brief imaginatively and gave a short speech that is remembered 150 years later. Likewise, when asked to give a research presentation, be imaginative in how you interpret your instructions. For example, when asked to give a talk about a research paper you may think that your job is to present your research paper. It is not. It is to present the key idea in your research paper. You may find that the best way to do this is to talk about some things that do not appear in your paper and to avoid talking about some other things that are in your paper. Be imaginative in getting your message across. Lincoln concentrated on getting his key message across to his audience. It is challenging to prepare a two minute presentation, but at least Lincoln knew that, in two minutes, he had time to convey only one key idea. In a research talk, it is all too easy to try to convey many different ideas and thereby confuse your audience. When preparing a talk decide what your key message is and ensure that that message is communicated clearly to the audience. Previous Post: For how long can we preserve Citizen Kane? Next Post: Is academic life compatible with family life?